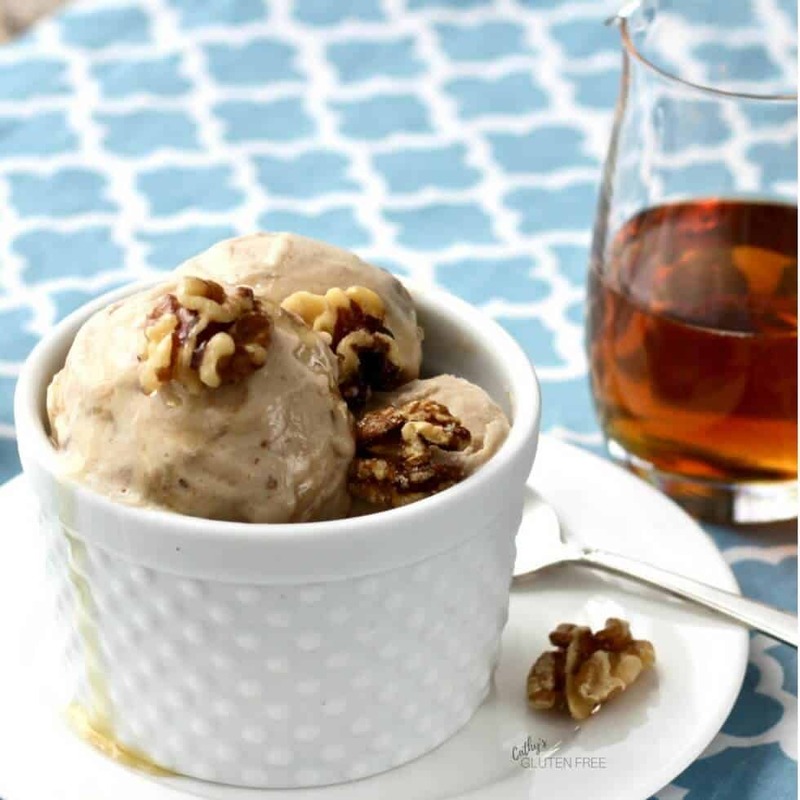 Maple Walnut Dairy Free Ice Cream is delicious creamy goodness for a hot summer’s day! In fact, it’s a great treat anytime! We’ve had a bit of a heat wave around here. After the long, cold winter we’ve endured, warm weather is especially welcome! 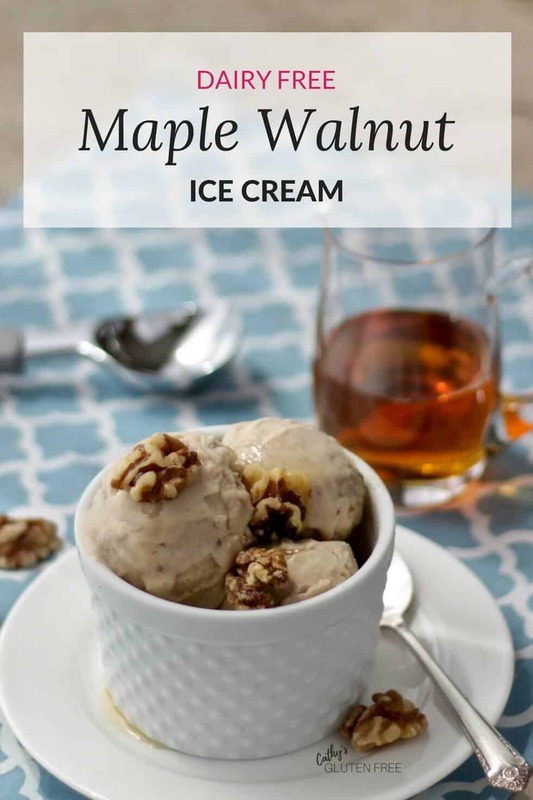 Given that I had just visited our local maple syrup producer and picked up our annual jug, plus more for our expat kids, it seemed like the perfect day for some Maple Walnut Dairy Free Ice Cream. 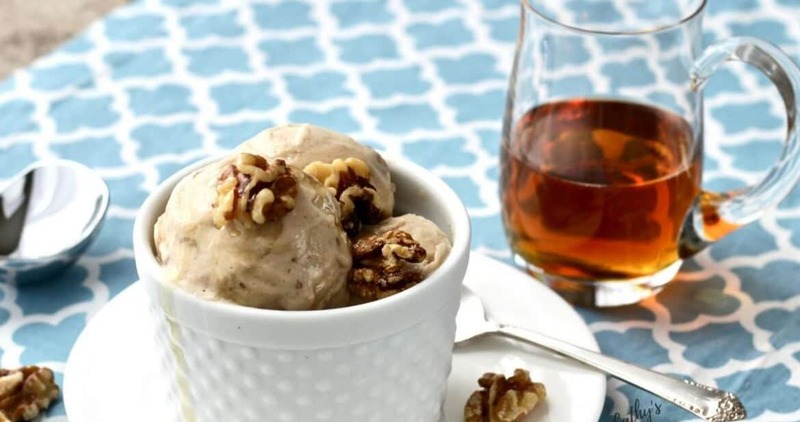 This recipe utilizes a high speed blender and an ice cream machine. Both were purchases that I had put off for years because of price. However, we have worn out more than one cheap blender. I must say that had I started with the good blender, I could have been enjoying smooth smoothies all along. With a high speed blender, things like the dates in this ice cream blend nicely rather than leaving little flecks and pieces in my liquid. The ice cream maker was another purchase that I had considered for a long time. My reasoning for buying one was that I could make healthful, whole food ice cream with “real” ingredients and no artificial additives and preservatives. Now that I eat mostly dairy free ice cream, the machine is even more valuable to me. The tricky thing about homemade ice cream, and I’ve had this problem with both dairy and nondairy recipes, is knowing when to remove your ice cream from the machine. The ice cream maker operates on the principle of a frozen bowl chilling the ice cream while your mixture is constantly being stirred. You want to allow the process to continue until your ice cream is as thick as possible. However, if you wait too long, the bowl will get warm from the heat of the motor. It can actually reach a point where your ice cream begins to soften again. For best results, be sure your mixture is well chilled in the refrigerator before you begin to process it in the machine. Then, as it gets near to finishing, after about half an hour, watch it closely so you can remove it at it’s thickest. I take my ice cream from the machine and store it in an airtight plastic container in the freezer. After a couple of hours, mine is perfect for scooping! However, there is nothing wrong with eating it straight from the ice cream machine, either! If you’re into maple syrup, you might also like to pour it over gluten free Almond Teff Pancakes or make Maple Glazed Carrots with Pecans. I also have a recipe for Dairy Free Vanilla Ice Cream for you to dress up with your favourite toppings or enjoy with pie or cake. Sprinkle gelatine over 1/4 cup cold coconut milk (from carton). Stir in 1/4 cup boiling water until gelatine is completely dissolved. Add remaining 3/4 cup coconut milk, canned coconut milk, dates, maple syrup, vanilla, and dissolved gelatine mixture to a high speed blender. Process until smooth. Chill this mixture in the refrigerator for an hour. Process the coconut mixture in an ice cream machine according to manufacturer's direction. 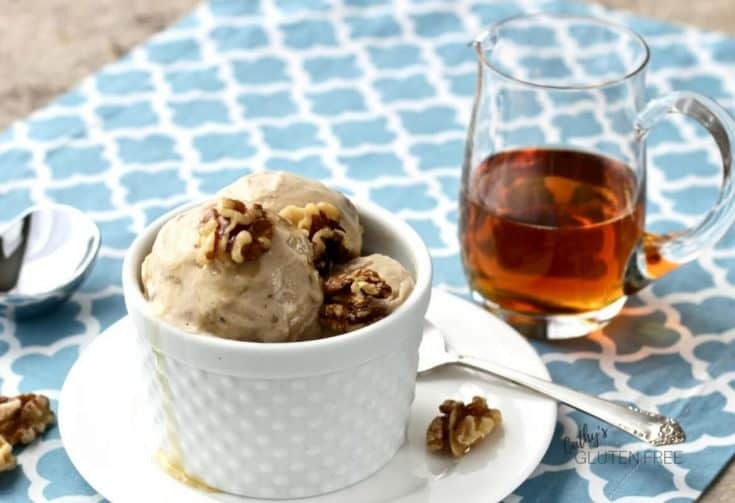 When ice cream has finished processing, stir in walnut pieces. Either enjoy some soft ice cream right away, or store it in an airtight container in the freezer. After a couple of hours, stir it up and eat it or return it to the freezer. These are the pieces of equipment I use. Ohhh I think I need to get an ice cream maker for the summer. I love maple syrup and this recipe looks delicious! I don’t think you would regret the purchase! Thank you, Diane! Enjoy your DF ice cream! This sounds perfect. I’ve been debating on investing on an ice cream machine as well and you are making me think tht I need to! Wow, that flavor combo sounds amazing! I’m always up for trying new ice creams, so I’m going to have to get my hands on all the ingredients! Thanks, Raia! I hope you enjoy it! what a delicious combo! My hubby always makes fun of me loving butter pecan…says it’s an old lady flavor!! Whatever?!! This combo reminds me of that! I love butter pecan, too! Oh I love dates blended into ice cream. This looks wonderful!! This sounds so dreamy! I want some right now! Perfect for warm summer day. Maple Walnut is my own personal favourite just before chocolate!! I wish I had an icecream machine — and would make this right away! Will pin and keep on hand for that dream item to become a part of reality!! Thanks for sharing. I love dairy-free and gluten free recipes. I’m so happy that I hit upon your favourite! I hope you get that ice cream machine someday. Yum! I love ice cream! Great summertime treat. I need to break out our ice cream machine and try this. Yummm! We harvest sap and make our own maple syrup, so this is just perfect! Oh, that’s so great that you make your own maple syrup! We did it once when the kids were young. I’ve only ever made banana nice cream and haven’t tried coconut milk. I totally have to now though! 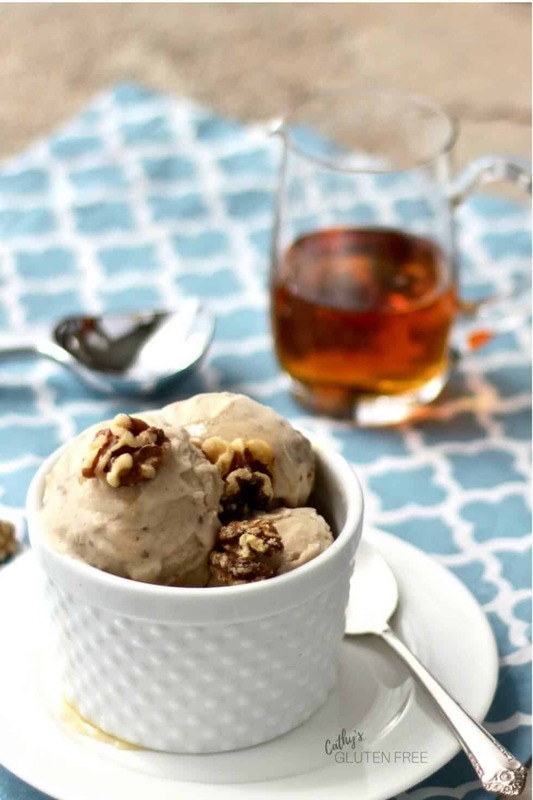 I LOVE homemade ice cream, it’s one of my favorite things. I also love that you made this with gelatin, it’s so great added to dairy-free ice cream, it totally helps the texture. Love those dates in there too! Yum! Thank you, Emily! It’s great to be able to enjoy a wholesome ice cream, isn’t it! I definitely need to get an ice cream machine before summer hits. This recipe is an inspiration. You’ll love having an ice cream machine! I love my ice cream maker but rarely use it – I have to dust it off for some dairy-free goodness! Oh, yes! ’tis the season! This sounds so good! I recently bought the ice cream attachment for my Kitchen-Aid mixer and am SO excited to try it soon! 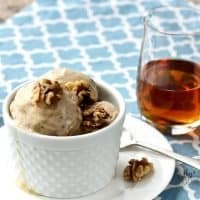 Although I do occasionally buy pre-made ice cream at the store (dairy and non-dairy, always organic), I love the possibilities of making my own and controlling the ingredients! Pinning this to try later! I think the KitchenAid attachment is a great idea. It will keep the ice cream away from the heat of the motor. I just put the cooling chamber of my ice cream maker in the freezer so I can try this delicious sounding (and healthy!) ice cream! What a delicious treat to enjoy on a warm summer night! Thank you for the recipe!